“The Guestworker,” tells the story of Don Candelario Gonzalez Moreno, a 66 year-old Mexican farmer who has been coming to the U.S. since the 1960s to do farm work. 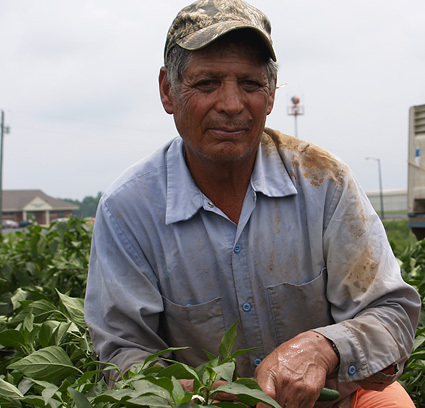 He is some twenty to forty years older than all of the thousands of Mexican men who work in today’s United States’ H2A Guestworker program started in 1986. Despite his age, he continues to work long hours in tobacco, cucumber, and pepper fields, sweating and worrying — all for his family, particularly his ailing wife. He talks about being old, knowing, as he says, he’s “already been squeezed.” He says he still wants to work “harder than all the others” as he did when he was a younger man, but now knows he just can’t. Yet he is asked back, year after year, because of his commitment to hard work, his “good attitude,” and his long-term service to Wester Farms in North Carolina. We follow him through one grueling season, learning about one man’s life in-depth, and through this intimate and personal story we learn about this little-known guest worker program now already in existence for twenty years. Though President George Bush and members of Congress have proposed guest worker programs as part of new immigration reform legislation as though nothing like this has existed before, in actuality the H2A temporary visa program came into existence in 1986 as part of Immigration Reform and Control Act passed during the Reagan years. And since this program’s inception, “Don Cande,” as he is affectionately known by his co-workers, has been a participant. He joined the program, paying as much as a thousand dollars of his own money to participate because he had already tried life as an undocumented worker and had been to jail three times. Too old to risk his life crossing the border illegally, in the film he says he comes to the U.S. on a chartered bus the H2A program provides, crossing the border mostly without incident, because it is safe. There is much to complain about, but he refrains because he knows the program is his only ticket to reliable work. Because this timely film reveals the lives of guest workers during present-day discussions of revitalizing and increasing the guest worker initiative, perhaps increasing to hundreds of thousands of workers, it promises to help answer questions many U.S. citizens have about bringing non-citizens here to do work for us in this country. Numerous people have seen the work as a work-in-progress and have raved about its balanced presentation of the H2A program through human stories of farmworkers and farmers. Through the film, viewers get to know Don Cande and his co-workers intimately. He narrates the film, and speaks passionately about his love and devotion to his family. Viewers see the difficult conditions he endures working alongside much younger men on a hot North Carolina farm, and, traveling alongside, we witness his joy as he returns home to Mexico at the completion of the growing season. Perhaps most poignant, Don Cande reveals that he too is a cattle farmer — as is his employer. Moreno looks back in the film at his own privilege of landownership as a consequence of the Mexican Revolution led by Pancho Villa, who was born in Moreno’s home state of Durango. His tears at Pancho Villa’s birthplace reveal the heroic and historic proportions of both their lives simultaneously. The Mexican scenes are visually stunning and provide a powerful counterpoint to scenes on the farm where he works in North Carolina. In Mexico, we see that Don Cande loves his home and family and does not want to leave either. Scenes with his grandson are touching as the two reconnect after Moreno’s long season away. But, as the rural economy in Mexico further deteriorates, Moreno has no choice: he must either make the yearly journey to the U.S. and work, or, remain in Durango where there are few, if any, employment opportunities. The film also chronicles the life of North Carolina farmer Len Wester, Moreno’s employer, who suddenly faces the prospect of losing his farm during a severe drought. As Wester worries and waits on rain, so do his workers. So, as never before seen in film, farmworkers and farmers are thrown together in film, each of their fate intertwined in their collective struggle for survival. Both are victims of nature’s wrath. Both are working together across their language barrier to salvage a livelihood. Shot over a two- year period in North Carolina and Mexico, “The Guestworker” was directed and produced by Durham, NC filmmaker Cynthia Hill (“Tobacco Money Feeds My Family” and “February One”) and Dr. Charles Thompson, Education and Curriculum Director at the Center for Documentary Studies at Duke University. As the United States engages in discussions of who will do our farm work and how they will be employed, words and phrases such as “illegal aliens,” “border guards,” “closing the gate,” and now even “guest worker” have become part of our national lexicon. Marches by thousands on May Day and at other times in the spring of 2006 highlighted the tremendous challenges the U.S. faces in the near future. Guest workers are central to the discussion. Now, the film “The Guestworker” has arrived on the scene, bearing a balanced presentation in both Spanish and English that offers a viewpoint unseen until now. Perhaps every member of Congress should receive a copy. Perhaps every American should see it before the vote on immigration reform begins. Certainly the film bears a message that we cannot afford to ignore. Cynthia Hill is an independent documentary filmmaker based in Durham, North Carolina. Hill grew up in Pink Hill, a small town in Eastern North Carolina. Hill began her production career working on health education media. For four years she worked as an editor at GLC Productions, a post-production facility in New York City whose clients included MTV, PBS, Lifetime, Nickelodean and many others. Hill began producing her own films in 1997. Her credits include Tobacco Money Feeds My Family (Producer/Director/Co-Editor), February One (Co-Producer) and Grace and the New Rules (Editor). Hill’s work has broadcast nationally on PBS and the Sundance Channel and featured in festivals around the globe. Hill is the 2003 Indie Arts Award recipient and the co-founder of the Southern Documentary Fund. Charles D. Thompson, Jr. is the Curriculum and Education Director at the Center for Documentary Studies at Duke University and adjunct professor of Cultural Anthropology and Religion. He is the author or editor of four books, including The Human Cost of Food: Farmworkers’ Lives, Labor, and Advocacy (University of Texas Press, 2002), which he edited with Melinda Wiggins. A former farmer and community organizer, Thompson now studies agriculture, farmworkers, and social change in rural areas in Latin America and the rural U.S. South. His latest book is entitled, The Old German Baptist Brethren: Faith, Farming, and Change in the Virginia Blue Ridge (University of Illinois Press, 2006). He is currently at work on a new film about Guatemalans who work in Florida. A Profile of U.S. Farm Workers,” Department of Labor Office Assistant Secretary of Policy, 1997. H-2A Agricultural Guestworkers, “Status of Changes to Improve Program Services,” Testimony before the Subcommittee on Immigration and Claims, Committee on Judiciary, House of Representatives, June 15, 2000. DVD copies of this program are currently available.